The monthly numbers don't lie. I'm pretty much a cultural phenomenon in Croatia. 1. 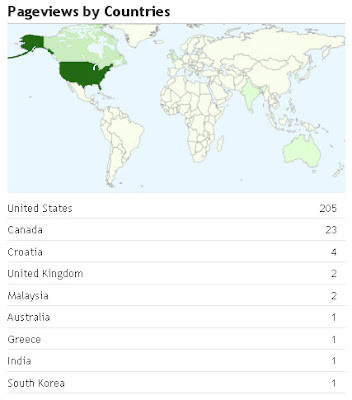 The numbers above represent page views from the last 30 days or so and where they originated from. And while I'm not exactly threatening Perez Hilton or anything, about a third of all the page views I've received all-time (and no, mine aren't being counted here) have come in the last 30 days. So either I've suddenly become a really kickass writer (But who are we kidding? I've always been a kickass writer) or the playlists are creating some momentum. Either way, thanks! This is really just a fun writing project for me, but it's nice to see that a few people are checking it out. I'm especially intrigued by the scant international audience I have. I'm sure they're probably coming across my website on accident during web searches (The word "jerk" has quite a wide range of meanings and uses, apparently) or just trying to hack in to something. But hey, who cares? Let me hear from ya, Croatia! 2. A few "housekeeping" notes (now I'm angling for "housekeeping-related" searches to inflate my site traffic). Some of you have reported not being able to see these "alleged" playable playlists that I post each week (which are placed directly below the iTunes tracklist image). I've deduced that many of you are reading my blog via Safari and since Apple and Flash apparently have some sort of blood feud going, this may be the issue. I don't know enough about all that tech crap to have a definitive answer, but those reading in Firefox, Chrome, and IE haven't been reporting issues. Except one person. And she's got a permanent technological disability (amongst others) that probably can't be remedied. 3. To keep the whole playlist theme going, I'm shamelessly soliciting ideas for my next playlist which will go up some time in the next few days. Am I masking my own lack of ideas via a solicitation that suggests I truly value your brilliant input? Don't worry about that. The point is that I would love some ideas on different themes, genres, or other funny bits (maybe a dozen songs that make you want to get divorced) you might have in that pretty little head of yours. Generally speaking, any feedback on the blog is appreciated--especially negative feedback. Remember, your hate makes me stronger in that Darth Vader-y sort of way. 4. Finally, I want to point you in the direction of a few of those links there over on the right. As I imagine my playlists have become essential to the auditory fabric of your epic life, I have all of them collected via the site that allows me to create them--8tracks--and you can access them by clicking on the link that says "Music Jerk Rob's Collected Playlists". You can go to that site and create your own embeddable playlists that won't be as good as mine but might still be fun. Also--especially for those of you outside of Oklahoma--check out the link to The Spy FM. It is a truly independent alternative and indie rock station and a constant source for me in the pursuit of great new music. It's easy to stream both on your computer and via your smart phone and I can't speak highly enough of their station and their music selection. Have a great Wednesday. I love you. Unless I don't. Rob, i want to see the "saucy time in the bedroom" playlist....duh. Pennsylvania: Nina Simone, The O'Jays, Coltrane, The Hooters, The Vogues, The Bloodhound Gang, Ween, etc. Of course you blame me. That line of logic is one of your disabilities. Your most fatal flaw, obviously. Good luck turning Croatia against me. I'm legendary now.